Main opposition Republican People's Party (CHP) revealed Sunday its manifesto for Turkey's local elections slated for March 31 with an emphasis on social and economic policies to be implemented by municipalities. The 12-point manifesto was announced by Chairman Kemal Kılıçdaroğlu before party administration, candidates, their supporters and party members gathered in Ankara Sports Hall in the center of the Turkish capital. CHP's candidates in Turkey's three largest cities of Istanbul, Ankara and Izmir, namely Ekrem Imamoğlu, Mansur Yavaş and Tunç Soyer, accompanied Kılıçdaroğlu in the event. Kılıçdaroğlu's speech was mainly focused on the economy and rising food prices, which is expected to be the soft spot of the ruling Justice and Development Party (AK Party) in the elections. The CHP chairman argued that Turkey's economic independence is at stake now, and criticized the government for policies leading to high interest rates and payments, increasing public debt and decrease in production, especially in agriculture. Kılıçdaroğlu blamed "mismanagement" for the problems in Turkey. "The current political power cannot come up with solutions, but complains to citizens. If you're complaining, then you should leave your seat and people who [can] solve problems will take it. Those who have been in power for the last 17 years don't have the right to complain," he said. At the core of CHP's election promises is to implement 2,200 Turkish lira ($418) minimum wage in all CHP-run municipalities, which is higher than the TL 2,020 minimum wage determined by the government and trade unions in late December. The party started implementing this policy as of January 2019 and emphasizes this point under the poverty title in its manifesto. The center-left CHP is cooperating with the right-wing Good Party (IP) in most municipalities as the continuation of the Nation Alliance formed for the June 24, 2018 presidential and parliamentary elections. The alliance also included the conservative Felicity Party (SP), and the CHP and the IP are currently in talks with the SP to extend their cooperation in local elections on a similar scale. Their main rivals are the People's Alliance of the conservative AK Party and the right-wing Nationalist Movement Party (MHP). 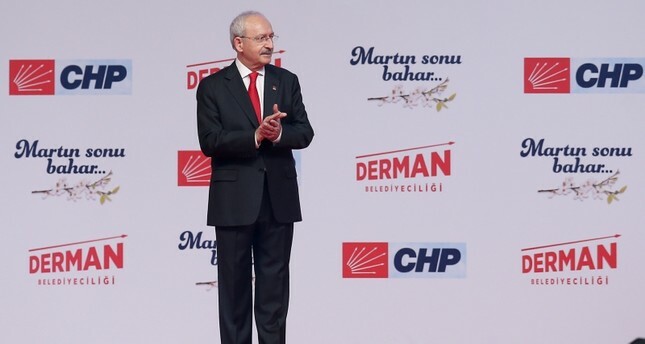 In his speech, Kılıçdaroğlu extended his greetings to IP Chairwoman Meral Akşener, SP Chairman Temel Karamollaoğlu and their fellow party members. The pro-PKK Peoples' Democratic Party (HDP) and its voter base is expected to support CHP-IP candidates in many areas by not nominating any candidates or low-profile campaigns, although the two groups refrain from talks on an official platform due to a possible backlash from their voter bases. However, the CHP, already plagued by intraparty divisions due to the leadership race between Kılıçdaroğlu and intra-party opposition headed by CHP's June 24 presidential candidate Muharrem Ince, underwent a difficult and prolonged process for determining its candidates. The CHP administration and Kılıçdaroğlu, who failed to emerge victorious in four parliamentary, two presidential and one local election in addition to a crucial system change referendum, were blamed for nominating figures closer to their line at the expense of popular and experienced candidates with independent stances or ties to the intra-party opposition. This, along with concessions to the IP for their cooperation, led to mass resignations on a local scale, while many prominent party members also left their positions. Pundits have claimed that the CHP might find it hard to attract its voters to the ballots on the election day.